The body is designed to work as one harmonious system, to follow arcing and spiraling paths of motion, and to transition from one movement to the next smoothly and efficiently. GYROTONIC® method creator, Juliu Horvath, designed a specialized line of equipment around these natural movement patterns of the human body. Because Gyrotonic equipment is highly adjustable, it can be customized to fit each person's unique physique and ability, adapting for things such as height, arm and leg length and physical ability. 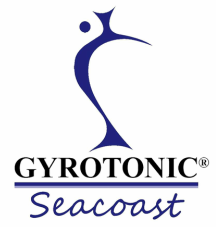 GYROTONIC® Seacoast features two Pulley Towers, a Jumping-Stretching Board, an Archway, and a Dragon (for children). The Gyrotonic Pulley Tower Combination Unit is the result of over thirty years of research and development, and is the most widely used piece of Gyrotonic Equipment. The pulley tower provides smooth, even support and resistance via a unique, weighted pulley system. The adjustable bench and rotating handle unit can be customized to fit the individual proportions, and movement capacities of each user. The design of the equipment supports the full, and natural range of motion of the joints, allowing for three dimensional, functional movement, and eliminating the sharp starts and stops where most injury occurs. A broad range of exercise sequences and modification options make the Jumping Stretching Board accessible to people of all levels of strength and flexibility. Due to its versatility, and popularity with clients, this is often the first piece of specialized equipment added to a Gyrotonic studio. The ergonomic, gliding platform allows users to experience running, and jumping in a low impact, horizontal plane, with the spine and pelvis fully supported, making it ideal for post injury exercise. Four independent gliding slides, with optional rotating platforms, provide for challenging strength and coordination sequences. The Archway is considered by many to be the most physically demanding piece of specialized equipment. The vertical, tiered ladder design of the Archway accommodates advanced strength and stability sequences by allowing users to perform exercises in various relationships to gravity - vertical, horizontal, diagonal, and inverted. The included propeller accessory and adjustable arms provide standing, and rotation exercises for people of various abilities- beginners to advanced. The Archway is especially popular with dancers, and athletes. The Gyrotoner facilitates hip, and shoulder articulation in a myriad of different planes. It is an especially useful piece of equipment for mobilizing the thoracic spine, and for coordinating hip, and shoulder movements with the spine.